DC30 Vs DC31 Vs DC34 Vs DC58 -- Which Dyson Handheld Vacuum Should I Buy? 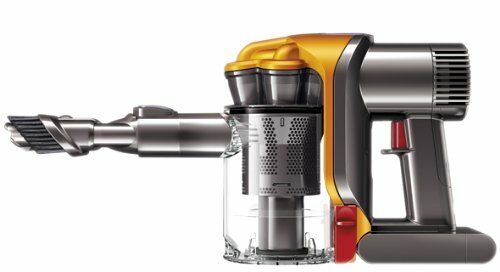 Here is a complete guide to all of Dyson's portable handheld vacuum cleaners (DC30, DC31, DC34, DC58) -- giving you an summary of specifications & features, helping you to ultimately decide which model is best suited for you as well as which version of that particular model (i.e Multi-floor Vs Animal) meets your specific cleaning needs & preferences. The Dyson DC30 - this model is the first edition of the Dyson handheld vacuum range and to be fair its overall performance somewhat reflects this. It is fitted with the first edition Digital motor and standard Root cyclone technology -- hence doesn't suffer with loss of suction & can operates on a bagless mechanism. Moreover, with regards to mobility it is actually the lightest of the entire range weighing in at just 1.23 kg. However, where it is seriously let down is in the fact that it is fitted with just a 14.8 Volt lithium ion battery which implies two rather negative implications -- it isn't all that powerful & it only has a run time of approximately 6 minutes (which you then have to wait for 3 hours to recharge again) -- and you ain't going to get a whole lot of cleaning done in that time. Mind you, back in its day -- the DC30 was pretty much the industry leader & if you get it at the right price, is still great for spot cleaning and nippy pick-ups of dirt & debris. The Dyson DC31 (for more details) - an update to that of the DC30 as well as being the first cordless model to be integrated with a dual mode power system: standard & boost (which supplies 70% more power, for particularly tough stains etc.). Moreover, it is fitted with an updated digital V2 motor & a new fitted 22.2 volt lithium ion battery to provide even greater suction & cleaning power. With this however (although still incredibly light) it has gained some 0.07 kg from that of the DC30 (weighing in a 1.3kg). The DC31 also has an extended run time on that of the DC30 lasting up to 10 minutes on the standard mode & 6 minutes on its boost mode, again taking roughly 3 hours again to charge. The Root Cyclone remains & hence has the three distinct benefits over other conventional portable vacuum cleaners: i) it is bagless, ii) doesn't suffer with loss of suction & iii) it has a high effective pick-up rate of microscopic dirt & dust particles. It also includes attachments such as the combination tool (which can be used as a debris nozzle & brush tool for dusting). Note: With the DC31 Animal, you also get the same mini motorised brush tool as with the DC34 (see described below). 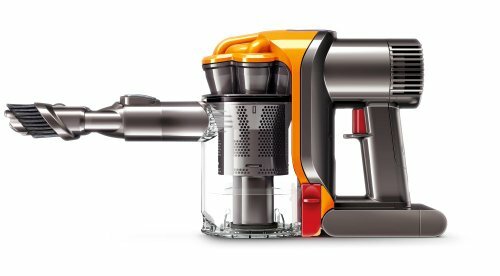 The Dyson DC34 (for more details) - this model is where you are going to likely get the overall best value, given that you can get hold of one for just under $170 & is a much better cleaning machine than the previous two mentioned. Where it produces an improved constant suction power of 28 AW on standard & 60 AW on boost mode ("twice the suction power of any other hamdheld in use") and has a run time of approximately 15 minutes on the former mode & 6 minutes on the latter (taking approximately 3.5 hours to fully charge). A lot of the aspects are still similar with the previous models however, with the 0.35 litres bin capacity & simple hygenic release mechanism as well as being lightweight & ergonomic. In all, basically a more powerful & better cleaning performer (run time etc.) of the DC31. When you get the Animal version of the DC34 you get also get the extra 'motorised brush bar' that has been specifically engineered for effective pet hair pick up through nylon bristles spinning in one motion every second. The Dyson DC58 (for more details)-- this latest model is pretty much THE 'all singing & all dancing' handheld vacuum being able to perform at "three times the suction of any other handheld vacuum cleaner in use". Hence is by far the most powerful & best in the range due to it mainly being pretty much crammed with the latest technology & engineering triumphs achieved by Dyson -- such as the two-tier radial root cyclone technology, Dyson Digtial V6 motor & re-configured cobalt battery which by its seldom supplies more than 50% of extra power than the 22.2 volt lithium ion battery (just under 100 AW on its boost mode -- comparable to that of a corded vacuum) to the handheld. Moreover, it has an extended run time of up to 26 minutes due to the new integrated non-trigger mechanism (11 minutes more than the DC34). Note: the Animal version (as opposed to the Multi-floor version) also comes with a new pet hair attachment -- the adavnced mini pet hair turbine tool. 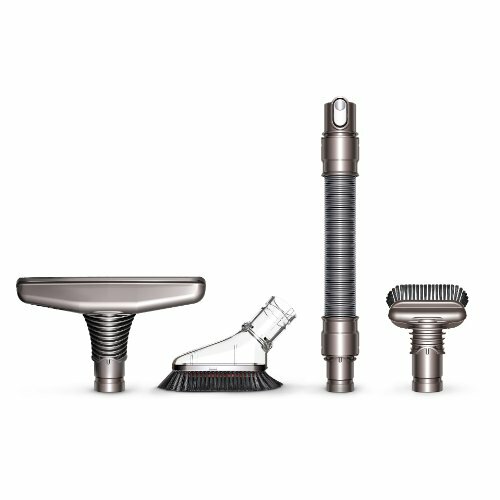 Also be sure to check the Dyson cordless tool kit that you can buy to improve the functionality of your Dyson handheld even further with four distinct attachments: the wide nozzle tool, the soft dusting brush, the extension house & stubborn dirt brush. Note: all models are backed by a two year warranty for both parts & labour when they are bought new. Which model will you choose and why? Also, if you have any remarks, questions or concerns regarding either the Dyson Handheld vacuum guide or about any of the models specifically (e.g. to clarify any further queries you may have between the DC58 Multi-floor Vs DC58 Animal) then please do not hesitate to make them in the comments section that you will find just below and we will be sure to get back to you as soon as possible.